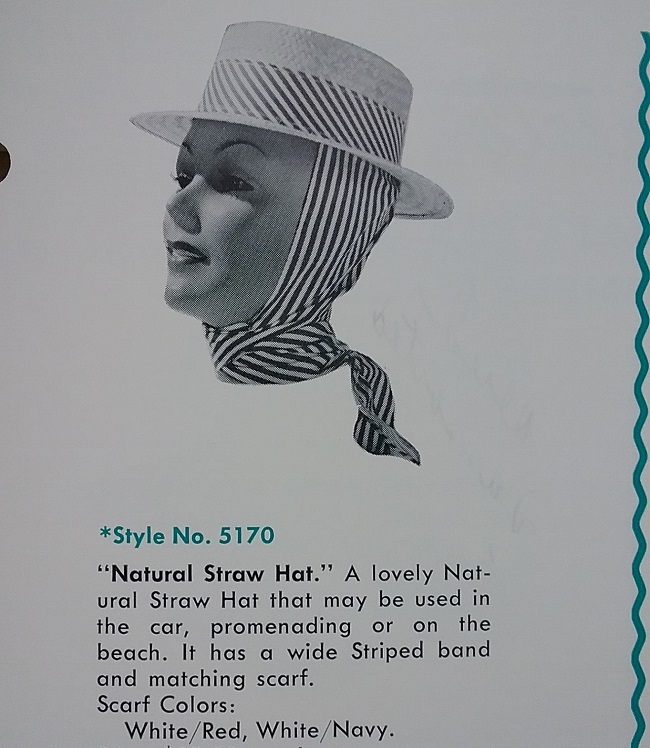 Almost as soon as women took to the water as bathers, they tried to come up with a reasonable solution to keeping their hair dry. 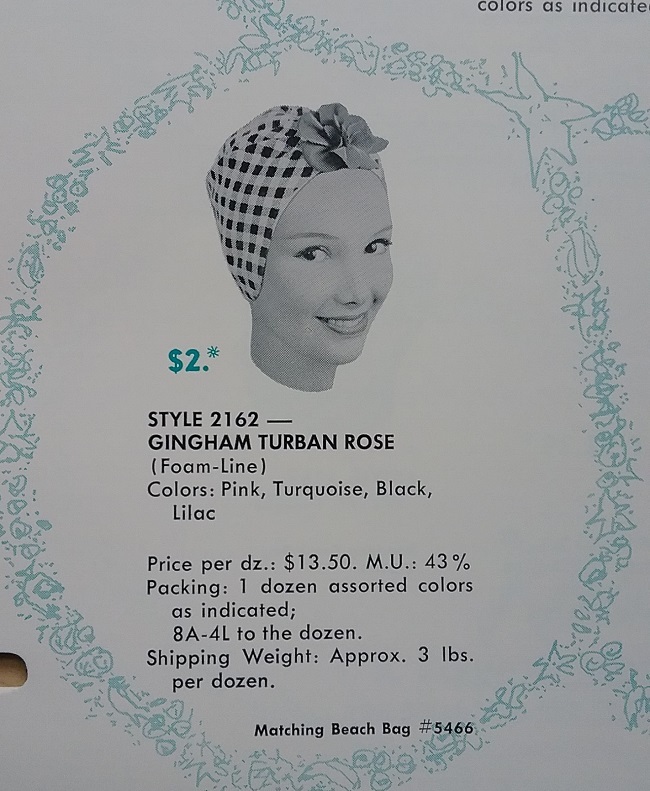 According to my search of the US Patent Office data base, the first rubber bathing cap was patented in 1887. 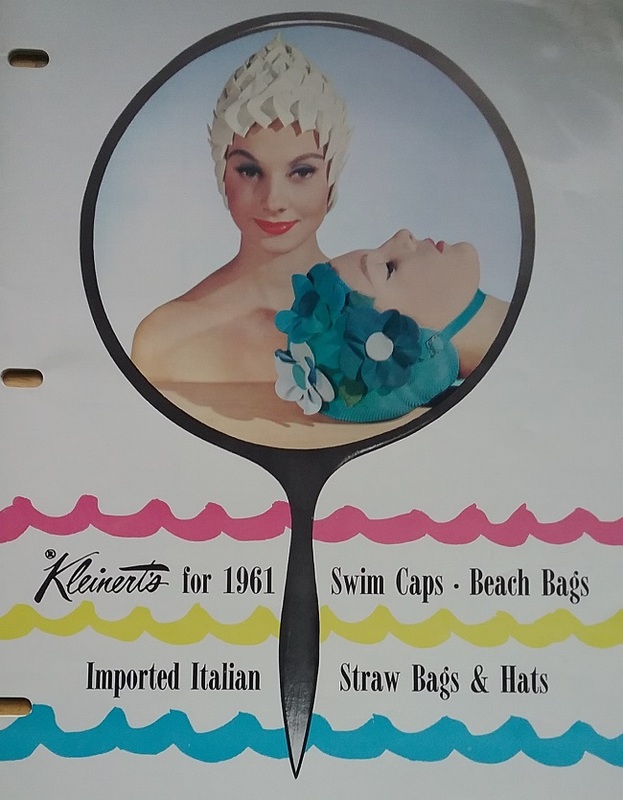 Over the next thirty-five years or so, bathing caps looked a lot like a present-day shower cap, with a lot of loose space in the cap to accommodate a women’s long hair. 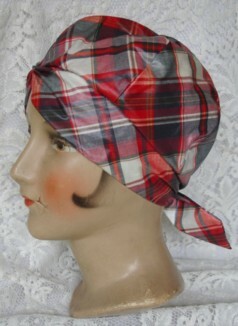 But as hair styles got shorter in the 1920s, the rubber bathing cap became more fitted to the head. 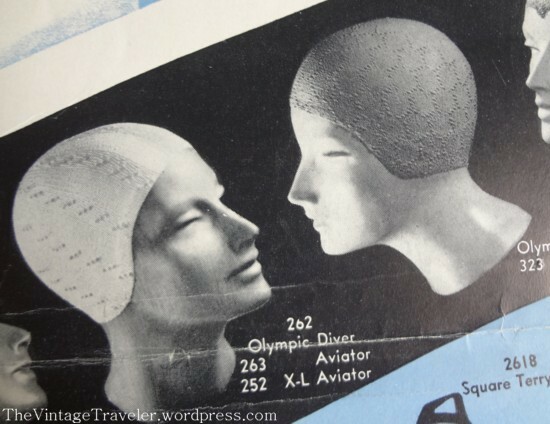 By the 1930s rubber bathing caps looked very similar to the ones that can be bought today. 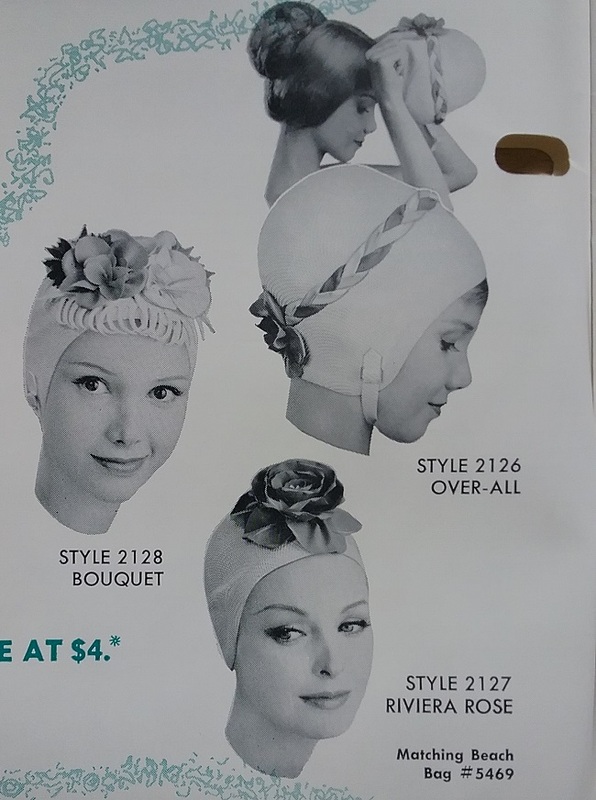 For that reason, bathing caps are really hard to accurately date. The cap above was a very lucky find. I pulled it out of a bin at the Goodwill outlet – a bin of “hard goods” such as plastic toys, video tapes, cookie tins, and all the other stuff people get rid of. It was a small miracle that it survived the last eighty years, but most of all, that it survived the mad scramble of Goodwill shoppers in their quest to find a bit of treasure in the bins. 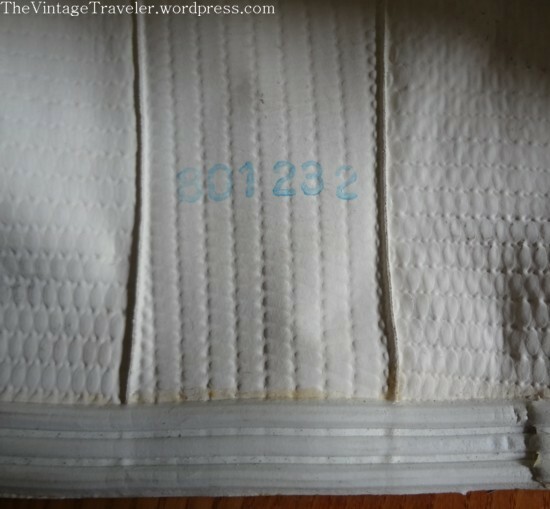 Inside, the only marks were the numbers, 801232. I thought that it could possibly be a patent number, but unfortunately it was not. Also note the rubber bands across the opening. These were thought to help keep water out. I found dozens of patents for these “seals,” all just a bit different, all an “improvement” over the others. 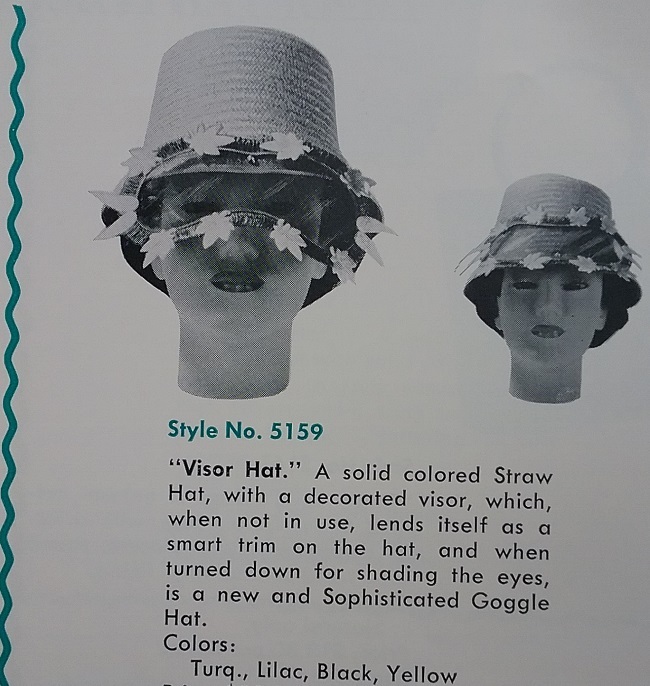 I have a 1930s Kleinert’s catalog that is not dated, but it did have an interesting bit of information. 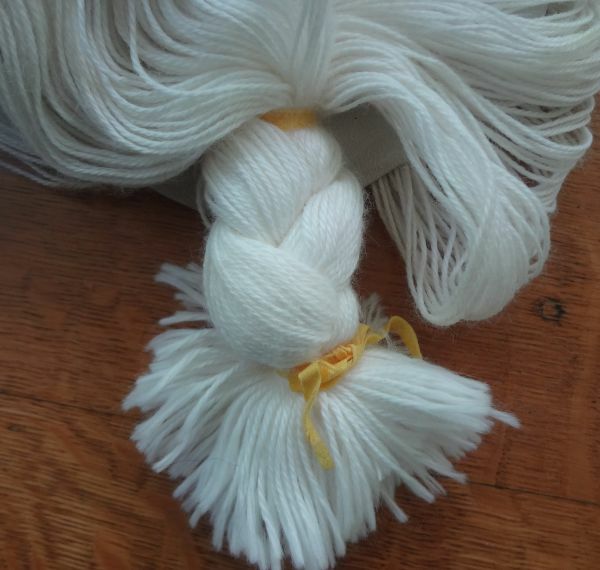 It mentioned that Kleinert’s caps were of the new seamless style. Two of the caps are shown above, and you can see how similar in style they are to my cap, but my cap has two seams that run front to back. 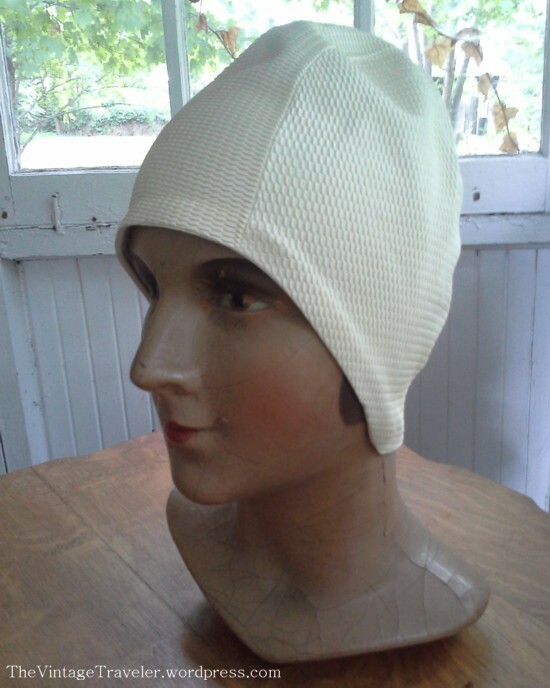 Here is a similar cap shown in a 1932 fashion illustration in Vogue magazine. 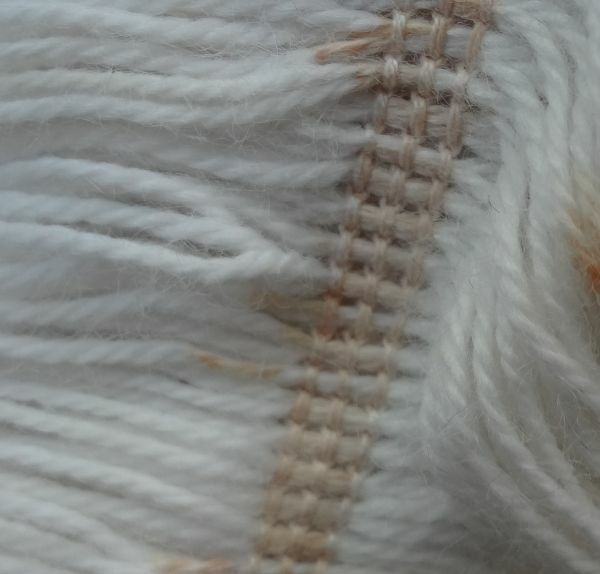 Because it is a drawing, there is no way to tell if it was seamed or not, but it does show that this style was used over the course of several years. 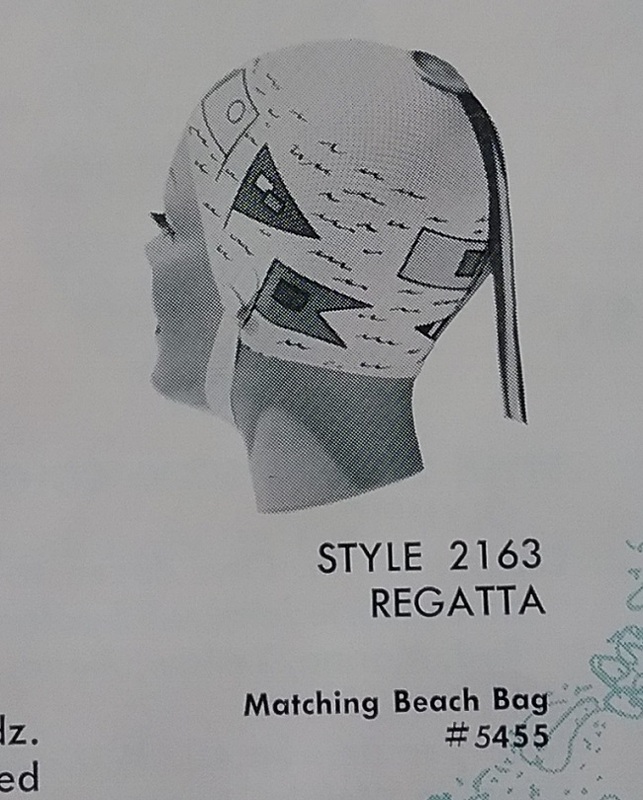 In this rather unfortunate photograph, the woman is wearing an early to mid 1930s style swimsuit along with a similar style cap, but with a strap. 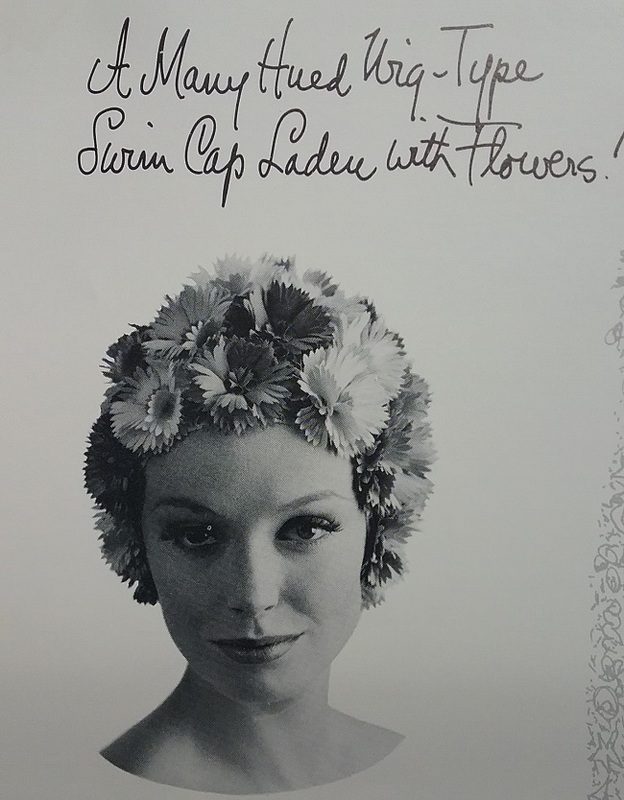 The photo above was taken in the late 1920s as an ad for a summer cap. 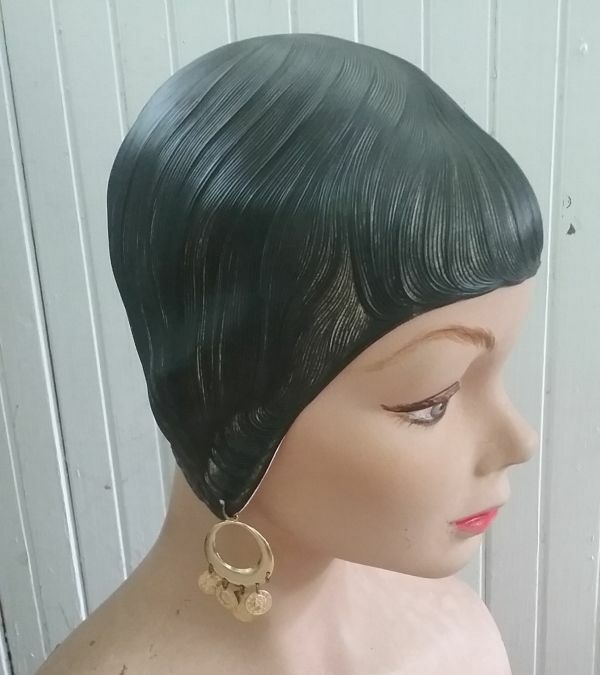 You can clearly see the seam in the side of one bathing cap, and it is not as sleek as mine or the ones illustrated that are from the 1930s. My best guess is that my cap dates from the early 1930s. 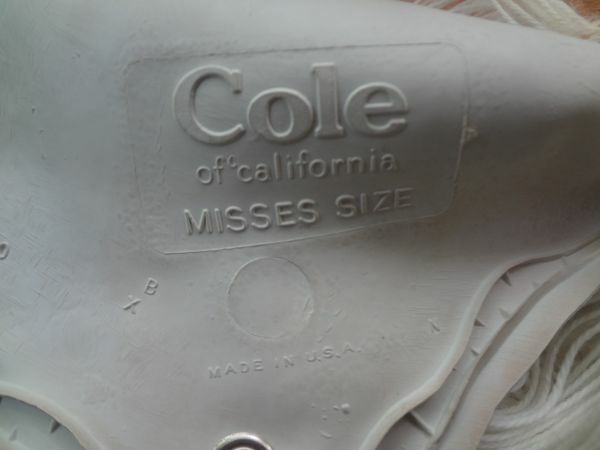 The earliest patent for making an unseamed cap is dated 1932. I’d never given a seam much thought, but a quick look through my caps showed all of the ones from the 1940s and more recent were all seamless. It must have been a big improvement. This one requires no thinking whatsoever. 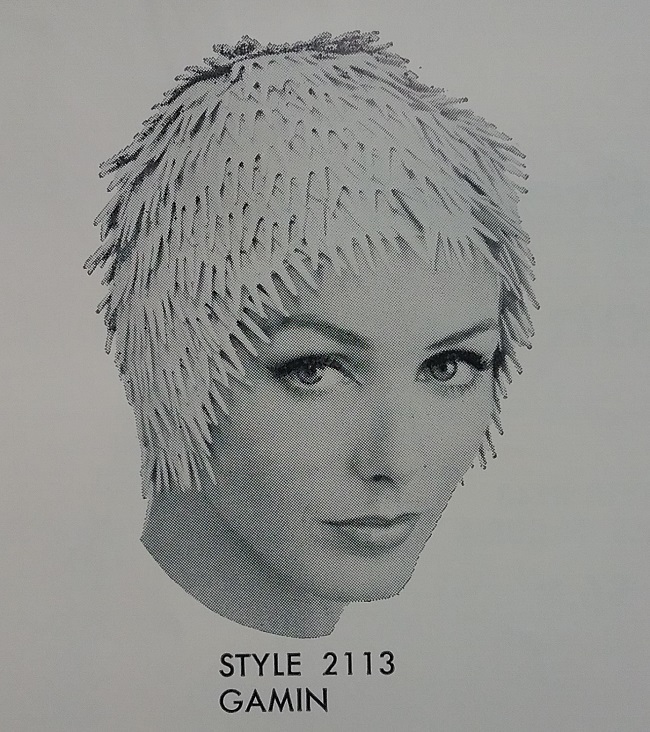 In fact, I often wonder when I see an item as trashed as this cap for sale in an antique store, “What is she/he thinking?” I mean, is there any remote possibility that someone is going to spend $9.68 for shredded rubber? It is possible that the cap started its deterioration after the vendor put it in the booth, but this is an antique mall I visit quite frequently, and a month ago the cap was not there. It’s kind of hard to imagine that it was so fragile that it would disintegrate this completely in just a few weeks’ time. For the life of me I cannot figure out why this item was offered for sale. Some things do not age well, and rubber is one of them. 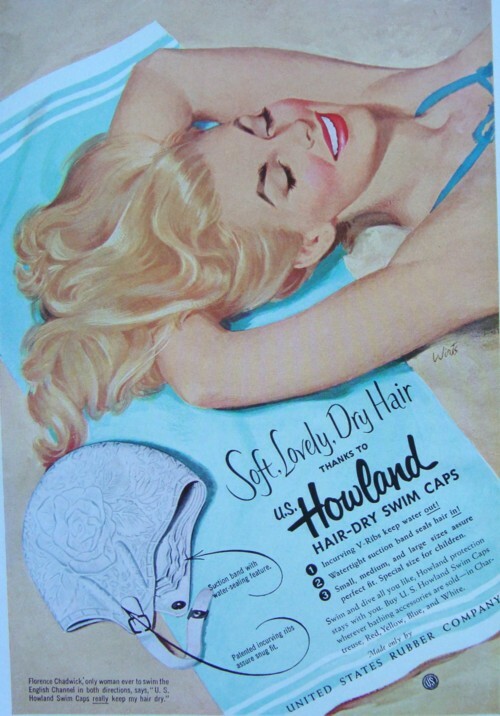 It gets brittle when exposed to heat, and bathing caps were also exposed to chlorine and saltwater. It’s not surprising that so many of them are literally falling to pieces. 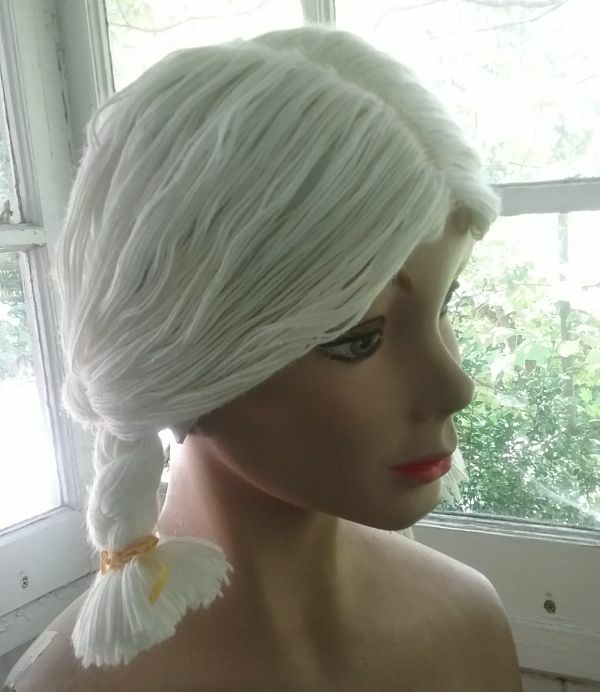 The last one I bought was on a head form in the store, and I took it to the sales counter instead of taking it off in the booth. You just never know when one is getting ready to split, and I’d rather the sales people take the risk. I’d love to have one of these caps with the applied flower petals, but this type is almost always damaged. The flowers tended to fold over and then sort of wilt, and if you look closely, you can see where the adhesive has become brittle and has failed. If you find a nice one online, be sure to examine the photos carefully for signs of deterioration and ask any questions you might have. These cannot be mended. I found this on eBay – Heaven only knows how as it was in the wrong category and even worse, in an eBay store. 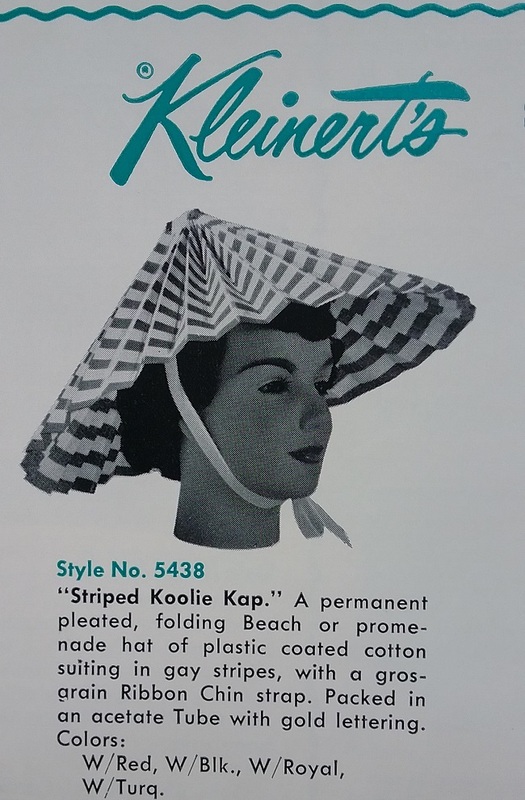 The seller was on the right track, as this is a beach hat, or cap, but it is much older than she suspected. I’ve been looking for one for a very long time, and this one just popped up on my screen. When I first discovered eBay eight years ago, I’d come home from work, pour myself a cup of coffee, and sit at the computer for 30 minutes and read through ALL the new vintage listings for the day. And this was before gallery images, so I had to actually read the titles. All vintage items were in one category – shoes, clothes, accessories, and there were no era divisions. 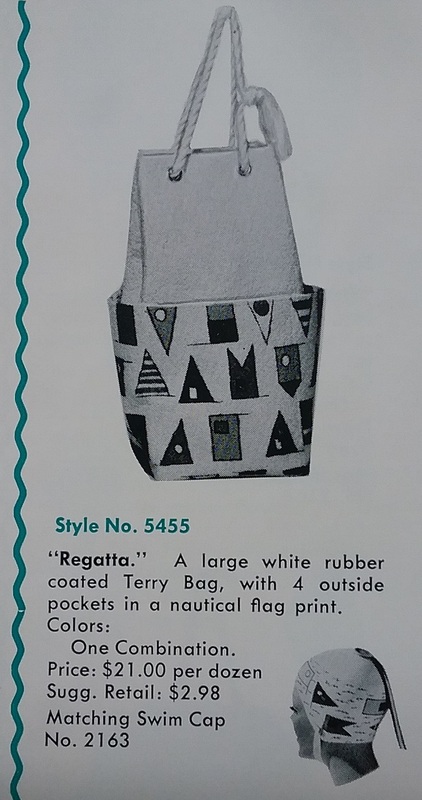 Rarely was anything newer than 1965 even listed, and for the most part, items were correctly dated. But as eBay grew, so did the interest in vintage clothing. 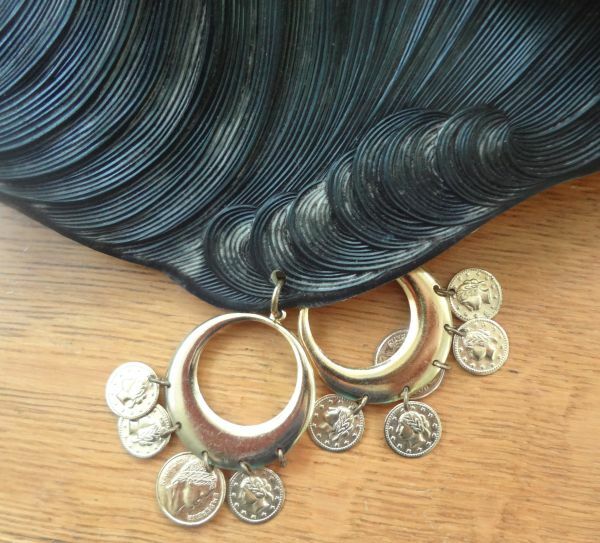 People saw how much money was to be made off what was perceived as thrift store finds. In the early days of eBay, most people selling vintage clothing were long-time vintage dealers. Now it’s anyone who finds something that looks old and funky or cool. After the listings started to grow and I could no longer look at each one, I came up with some search terms. 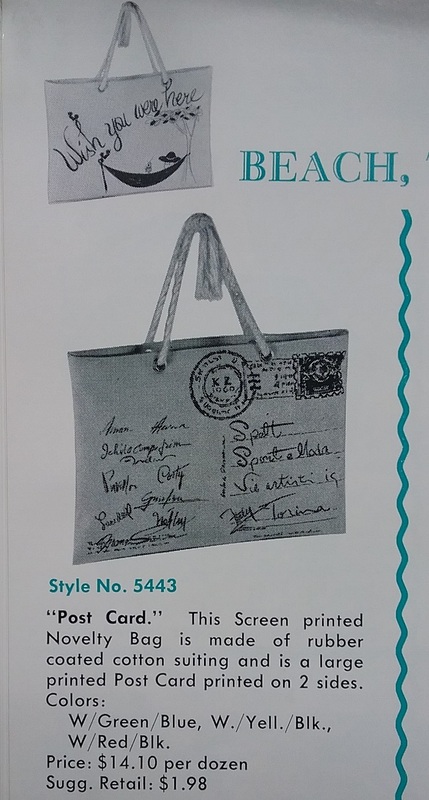 One I used was “Mod.” I found some great stuff using that word – a Mary Quant dress from 1966 and several pairs of great mid 1960s flats. But now, try using “Mod” as a search term in the vintage category. As of this minute, it returned 4887 items, including one in the 1920-1937 sub-category! Of course, the dress in question is not mod, nor is it from the 1920s – it’s an early 70s maxi dress! 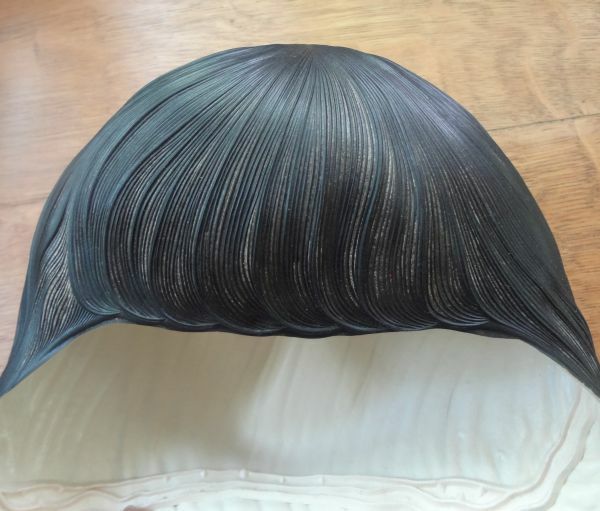 Needless to say, I don’t use Mod as a search term any longer, but I do have a few that I use regularly, and THAT is how I found this not funky but definitely cool swim cap!